They have a lovely sheen and coordinate perfectly with my collection that will debut at Market - both the warm and cool color stories! Can't wait to design with them. 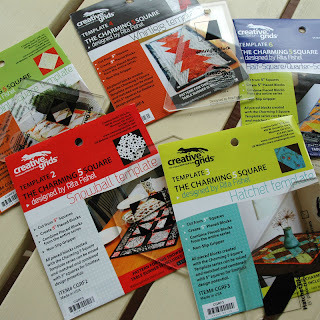 I also picked up these new charm square templates. They are 5" so would work perfectly with charms or ten squares. I'm interested in seeing how they can be used in combination with eachother. What a great idea for precuts! (But also for scraps, which we have a lot of around here.) I'll be posting some small, simple projects as I experiment with these tools. Your templates look cool. Your buttons are such pretty colors. Love the pretty spring colors of the buttons. Can't wait to see what you do with the templates! They don’t put everything on their website and they just got them in this week, but you can call them up – I know they have them. They have a lovely non-sitck surface that runs all aroud each template, making them so easy to use! Love the buttons! Can't wait to see your new line, the colours look lovely!